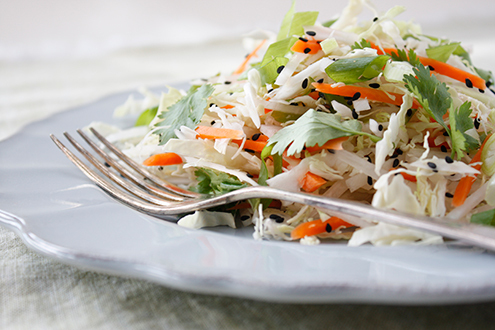 Combine cabbage, daikon and carrot in a large mixing bowl with most of the shallots, coriander and sesame seeds (save some coriander and seeds for serving). Whisk the dressing ingredients together along with ½ a tablespoon of water to thin it out. Pour this over the salad and toss well. Season with cracked pepper, garnish with remaining coriander/ cilantro, seeds and serve. Serving suggestion: To turn this salad into a meal serve with some grilled meat or tofu or a sliced hardboiled egg or two. This combination would make a low carb meal so you could accompany it with some fruit or a yoghurt for example. Post-GDM tip: Eating sprouts during pregnancy is not advised due to the risk of salmonella, however post-pregnancy, add a cup of sprouts (almost any kind; bean, alfalfa, mung etc) and a teaspoon of honey to the dressing.